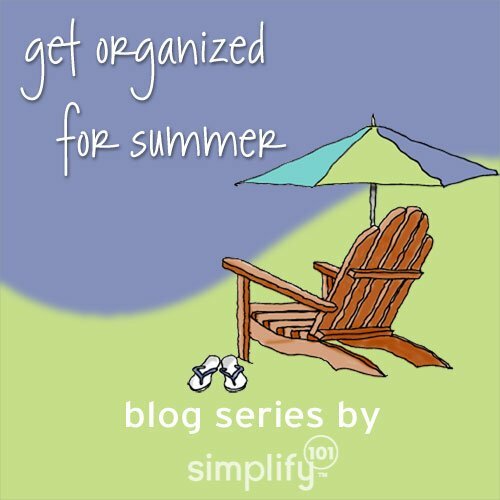 I have just a couple more posts left to go in our Get Organized for Summer Series. I hope you have been enjoying reading along. Today’s questions are related to balancing kids and work during the summer. I’d be happy to provide some thoughts. Here’s what I would do if my mother-in-law was watching my kids for the summer. First, I would schedule a time to chat with my mother-in-law about our mutual goals and ideas for the summer. I’d begin the conversation by asking what her goals or hopes are for the summer. And then I’d share some thoughts on how I’d like my kids to spend their time over the summer. For example, I might say that I’d like them to have plenty of opportunities to be outside, or read, or do creative projects, and I’d like to limit how much time the spend indoors watching T.V. or playing video games. Once I felt like we were in general agreement on our overall goals for the kids’ summer, I’d start brainstorming more specific ideas using the alphabetized bucket list (or other favorite bucket lists) as a springboard. I’d get her ideas on what she thought would be fun stuff to do with the kids with both of us keeping in mind our goals for the summer. I’d let her take the lead. Which activities is she in-law is naturally interested in? What sounds like fun? Together, we’d put together our own summer fun idea list. And then, I’d let her take it from there. This next question is from Holly who asked: I have a son with disabilities and due to him getting into trouble for truancy issues; I have had to register him for ALL KINDS of different programs for the summer. As I completed his “calendar” that helps him see what is coming, I realized “When am I going to find time for me to work on my education?” I am an online student and this summer feels so packed jam full of things for my child; short of NEVER SLEEPING; I don’t know how to get everything done. HELP PLEASE!! Thanks so much for ANY and ALL advice. Oh, I feel for you Holly! There’s nothing quite like realizing that you have more to-do than can comfortably fit on your calendar! Here are some ideas for you. First, I’d resist the temptation to add anything else to your calendar, until you have a feel for what you can fit in around all the scheduled activities. When you find yourself managing what is there already, then consider adding some more things into the mix. Second, can anyone help you transport your son to and from his various activities? Is there someone he could carpool with or do you have a friend, parent or neighbor who could help you out so you have more time to focus on your studies? If not, then I’d look for ways to make your studies as mobile as possible. Investing in a laptop with mobile broadband capabilities would allow you to study anywhere, while your son is doing his activities. Angela asked: I work from home and will have a 7 year old who will be with me at home a lot this summer. He says he just wants to play Legos all summer…I’m guessing the fun of that will wear off eventually so I’d love ideas for entertainment while I work …and oh yeah … He hates arts and crafts. 1. Explore ways to rearrange your work schedule. For example, if your spouse works during the day, maybe he would be willing to watch your son for a few hours in the evenings so you could work while he does things with your son. Or maybe you could start your work day earlier, and get some of your work done while your son is still sleeping. 2. Swap play dates with friends. Ask your child’s friend’s moms if they’d be interested in doing some play-date swapping, where you have one of your son’s friends over for a play date in exchange for a play date at the friend’s home. Schedule play dates at your home on your days off and schedule the away play dates during your work hours. 3. Look into day camps. When my kids were younger these were a life saver for both of us. It gave me time to work uninterrupted and gave them time to play with friends and do activities they wouldn’t have been able to do at home. They were well worth the investment. Books. Read books or maybe even write a book a book or two. Make maps…of his bedroom, your home, your town, or even an imaginary city. Plan an imaginary trip. My son used to do this for hours during the summer when he was younger. He would research travel destinations on the internet and then put together a little report. If you don’t want your son on the internet, you could pick up some travel books from the library. Do simple cleaning projects. Wiping down the baseboards, sweeping, dusting, etc. Anything he does while you’re working is time you can spend together (instead of cleaning) when you aren’t working. Check out activity books from the library…and see what ideas capture his interest. Write letters to grandparents or out of town cousins. Play with other building toys such as K’nex, Lincoln logs, etc. For more ideas, check out this summer activity jar from Over the Big Moon. (There are also more links to summer activity lists on my summer board on Pinterest.) If anyone reading has ideas for independent activities for kiddos during the summer, please share in the comments. Thanks for sharing!